Motor museum | It is fascinating to see how a large company can change a town. Mazda's head office is located in the Japanese town of Hiroshima. Even when closing in on the town Mazda cars dominate traffic. Almost every taxi is a Mazda. There's even a Mazda hospital. It's obvious who sponsors the "Zoom Zoom" stadium. In other words: this is the ideal location to investigate Mazda's history! Even in the distant past many small firms processing iron were located in Hiroshima. This, together with a lot of available space, was the ideal base for a car factory. Thanks to Mazda, the city has grown so much that it almost surrounds the factory. That becomes painfully clear during the short bus ride where visitors are transported from the main office to the factory floor. The premises is so large that it contains huge bridges over rivers and residential areas! 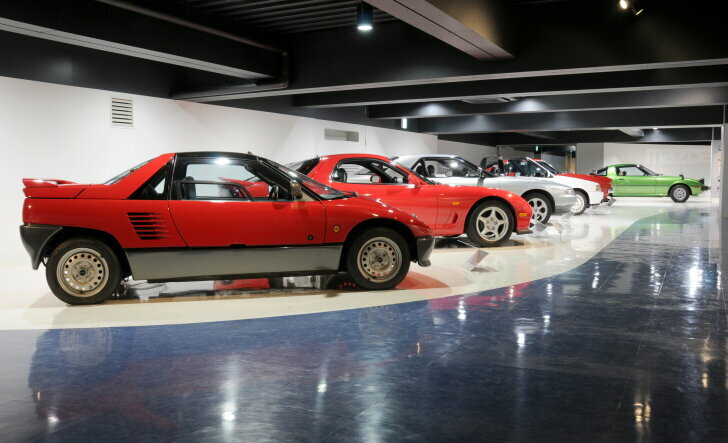 The Mazda museum is located in a former car park next to the factories. The ceilings are so low that the average European visitor has to walk around slightly hunchbacked! The story of the company that is now know as "Mazda" starts at an unfortunate time. In the 1930s the Japanese economy wasn't doing well. Most carmakers solved this by focussing on luxury cars aimed at those fortunate enough to be able to afford a car at all. Mazda chose a different option and developed a three-wheeler named "Mazda-go" (1931) to mobilise small entrepreneurs. In the early years Mazda's only competitor was Daihatsu, and so business blossomed. 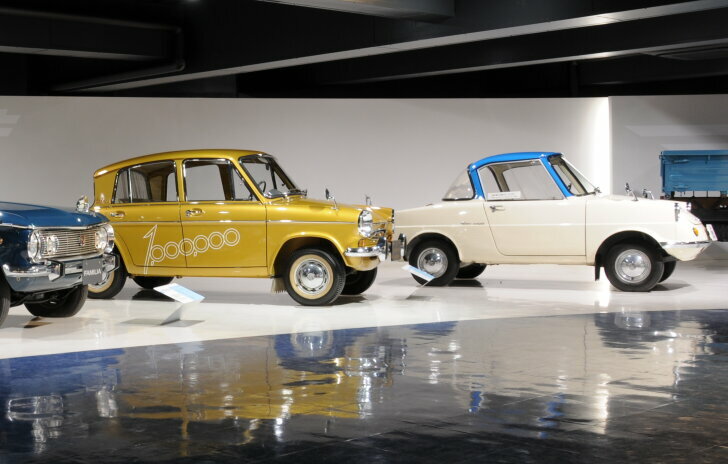 Mazda's first family car appeared in 1960: the "R360 Coupé" is a cute little car (white with blue roof on the picture) with rear-wheel drive and the engine in the rear (2 cylinder, 16 PS). The R360 did very well in the Hiroshima region; in other areas of Japan, Subaru dominated the market. The successor to the R360 was the "Carol 600 Deluxe" (1963), a proper four-seater with four doors. 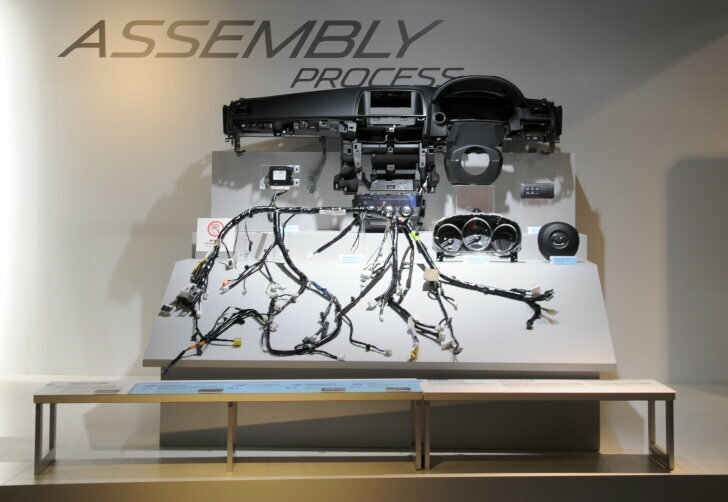 The example shown here is the millionth Mazda ever built and that's why this car moved from the assembly line right into the museum. While most cars in the collection can't be driven, the golden Carol did only 60 kilometres and is in fact brand new. 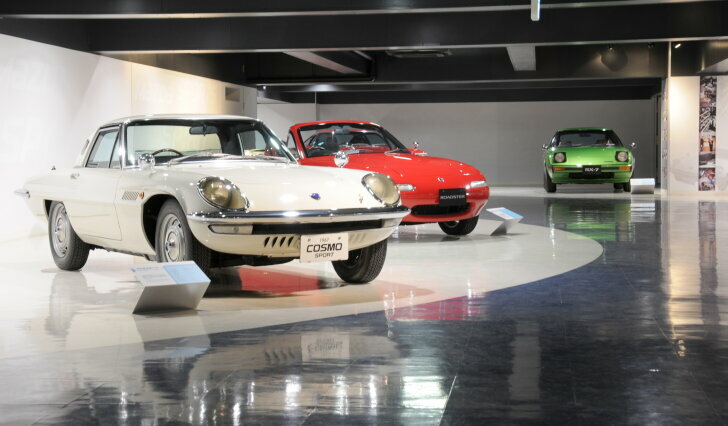 In 1967 Mazda showed its sporty side with the "Cosmo Sport". This coupé was the first to be fitted with a rotary engine (2 chambers at 491 cc each, developing 110 PS). A few years later the "Familia Presto Rotary Coupé" (1970) followed at half the price with almost the same engine. Thanks to its elegant looks the Cosmo always remained the most desirable of the two. In the next space, cars from the 1980s and 1990s are on display. 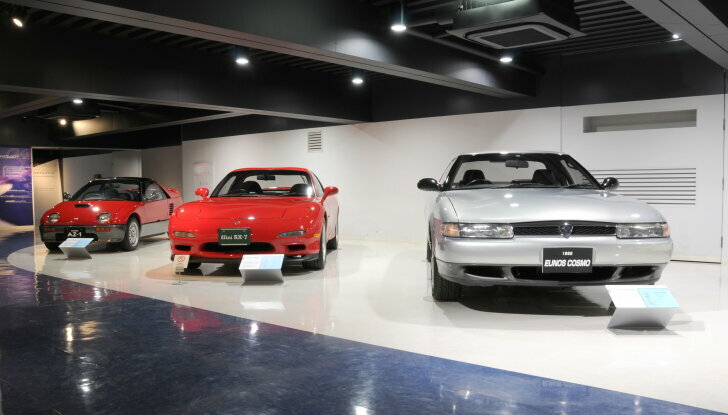 Again Mazda emphasises on technology with the "RX7" and the American-looking "Eunos Cosmo" (1992). The latter has never been sold outside Japan and has a rotary engine with three instead of two chambers. This makes for improved performance (280 PS) but also for even worse fuel efficiency. The moment of glory for the rotary engine was with the "787B" (1991) which was the first (and last) car to win the 24 hours of Le Mans for Japan. The 787B has four rotors and develops over 700 PS. This race car is the centrepiece of the room where the principle of the rotary engine is shown using countless models and displays. Mazda has been collaborating with Suzuki on developing compact cars for a long time. Even today, many Suzuki models are also available as "Mazda" in Japan. A very special Suzuki derivative is the "AZ-1" (1992). It is a tiny sports car with gull-wing doors and a mid-ship engine, which rates as a "kei" car in Japan and therefore benefits from many tax discounts. The first generation of the Mazda 323 is named "Familia" in Japan. It was the first Car of the Year in Japan (1980) and was available as a convertible on its home market. Next to it Mazda proudly shows off the Car of the Year 1982, the 626. 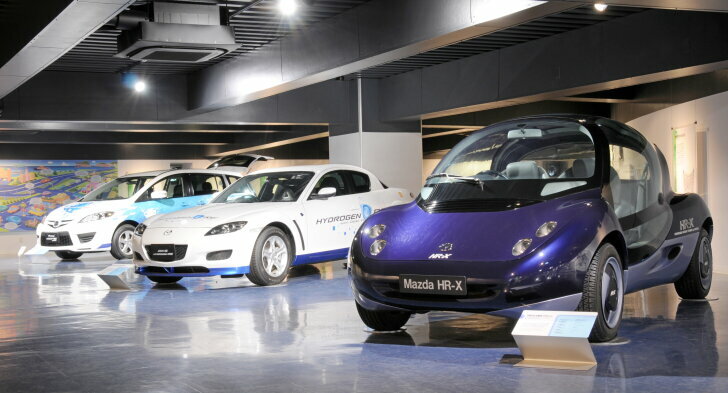 The Mazda museum also shows how cars are being developed. The latest Car of the Year is used to show the process: a Mazda CX-5. At the museum the original sketches, the scale 1:1 clay model and a mock-up of the dashboard are on display. Next, various displays show the process of pressing (turning raw metal into the shape of a body panel) via painting to the assembly of a car. After this the visitors are invited into the most interesting part of the actual factory: assembly. Here bare metal frames are fitted with windows, doors, a dashboard and turn into a car right in front of the visitors. As with most factories, photography is not allowed. The visitors are also kept at a distance, because they can only see the factory floor from a balcony metres above the actual factory floor. A collection of concept cars shows the future according to Mazda. With these cars it isn't about the looks, but about technology. Mazda has always been an innovator in the field of hydrogen. Mazda emphasises that it doesn't develop so-called "fuel cells", because the carmaker claims there are not enough outlets. Instead, Mazda develops a hybrid vehicle that promises the best of both worlds. The main office and the largest factory of Mazda are located in Hiroshima, Japan. After making an appointment, anyone can have a (free!) tour of the factory and the museum. The factory is special, because over time time both Mazda and the city around it have grown intertwined. That said, the museum is small, especially when compared with museums from other carmakers. This doesn't just go for the size of the collection, but also for the presentation. There are very few interactive items and the presentation is very basic. 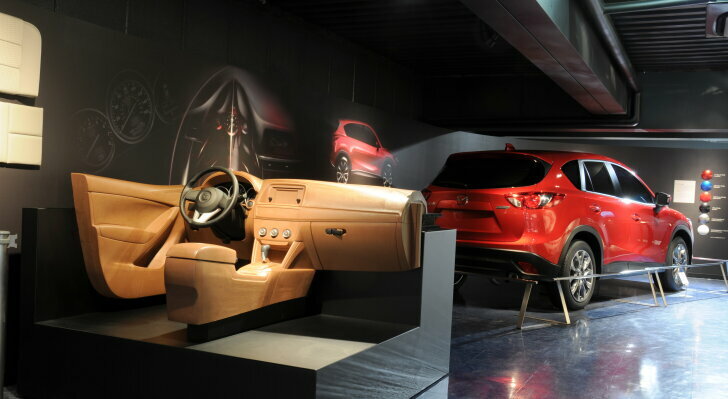 Despite this, the museum clearly shows the history of Mazda, the current production line and the plans for the future.